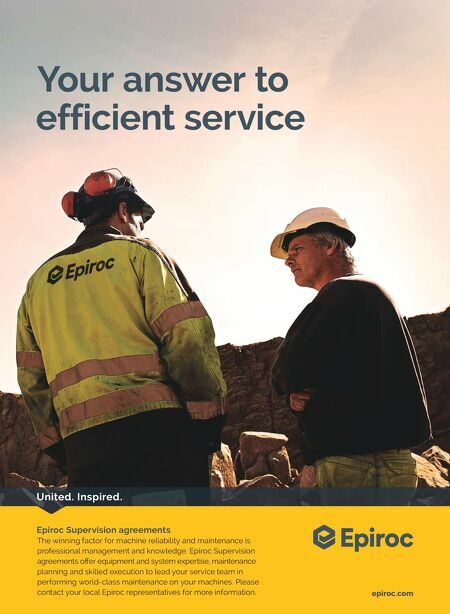 2 E&MJ • JUNE 2018 FROM THE EDITOR Having attended the three largest mining trade shows worldwide so far this year, it's easy to spot some trends in dialogue. One of them involves women in mining. The annual Society of Mining, Metallurgical and Petroleum En- gineers (SME) conference hosted a breakfast panel discus- sion (See Women in Mining, p. 74). The Prospectors and Developers Association of Canada (PDAC) planned a ses- sion on sponsorships for women in mining, but canceled it due to allegations related to scandalous behavior by one of its sponsors, which was exposed by the #MeToo movement. The largest exposition in Latin America, Expomin, also held a similar discussion, which was well attended. It didn't, however, take the local media long to point out the irony with Expomin. For those who haven't attended the event, many of the stands employ beautiful local models, some of which dress in rather risqué outfi ts. Some stands have music playing and, in the late afternoon, the pisco sours and Chilean wine fl ow. After the show opened, El Mercurio, Santiago's largest newspaper, ran an article questioning the commitment of the mining business to diversity with a photo showing one of models on the stand posing with miners. During the event, I also had a conversation with a female colleague, who works with a Spanish language magazine, and she felt Expomin had lost its Latin vibe. These were strange opposing views. While I was at SME, a member of the Women's Auxiliary to the American In- stitute of Mining, Metallurgical and Petroleum Engineers (WAAIME) invited me to attend their meeting. It was a breakfast and, while I was walking to it on a cold Minneapolis morning, I kept asking myself why I was attending it. As you will read in the article, there was a healthy, frank discussion about the role of women in mining and how they can better manage their careers. It's no secret that mining is a male-dominated business, and many mining com- panies are actively working to change that. A professional human resources consul- tant moderated a panel discussion that included male executives from three leading companies involved in the mining and mineral processing sector. During the discussion, the moderator talked about how motivated employees are seeking and given stretch assignments. Honestly, I was unfamiliar with the term. A stretch assignment is a project or task given to employees that is beyond their cur- rent knowledge or skills level to "stretch" employees developmentally. The stretch assignment challenges people by placing them in uncomfortable situations to learn and grow. As scientists and engineers, we have all faced stretch assignments in our ca- reers, but it didn't have the buzz word attached to it. It was just a diffi cult assign- ment. Writing this month's Women in Mining article was a stretch assignment for me. Had I known what I was getting into, I would have assigned another editor to cover the breakfast. My comfort zone is the technical aspects of mining and mineral processing and this article was way outside of that area. Now it's your turn to pay it forward. The next time you have a diffi cult project, delegate the assignment wisely. They say the engineering teams with the most di- versity achieve the best results. Try something outside your comfort zone and see if they are right. The Stretch Assignment Having attended the three largest mining trade shows worldwide so far this year, it's easy to spot some trends in dialogue. One of them involves women in mining. The annual Society of Mining, Metallurgical and Petroleum En- gineers (SME) conference hosted a breakfast panel discus- sion (See Women in Mining, p. 74). The Prospectors and Developers Association of Canada (PDAC) planned a ses- sion on sponsorships for women in mining, but canceled it Steve Fiscor Publisher & Editor-in-Chief Steve Fiscor, Publisher & Editor-in-Chief sfi scor@mining-media.com Mining Media International, Inc. 11655 Central Parkway, Suite 306; Jacksonville, Florida 32224 USA Phone: +1.904.721.2925 / Fax: +1.904.721.2930 Editorial Publisher & Editor-In-Chief—Steve Fiscor, sfi scor@mining-media.com Associate Editor—Jennifer Jensen, jjensen@mining-media.com Technical Writer—Jesse Morton, jmorton@mining-media.com Contributing Editor—Russ Carter, rcarter@mining-media.com European Editor—Simon Walker, simon.emj@btinternet.com Latin American Editor—Oscar Martinez, omartinez@mining-media.com South African Editor—Gavin du Venage, gavinduvenage@gmail.com Graphic Designer—Tad Seabrook, tseabrook@mining-media.com Sales Midwest/Eastern U.S. & Canada, Sales—Victor Matteucci, vmatteucci@mining-media.com Western U.S., Canada & Australia, Sales—Frank Strazzulla, fstrazzulla@mining-media.com Scandinavia, UK & European Sales—Colm Barry, colm.barry@telia.com Germany, Austria & Switzerland Sales—Gerd Strasmann, info@strasmann-media.de Japan Sales—Masao Ishiguro, ma.ishiguro@w9.dion.ne.jp Production Manager—Dan Fitts, dfi tts@mining-media.com www.e-mj.com Engineering & Mining Journal, Volume 219, Issue 6, (ISSN 0095-8948) is published monthly by Mining Media International, Inc., 11655 Central Parkway, Suite 306, Jacksonville, FL 32224 (mining-media.com). Periodicals Postage paid at Jacksonville, FL, and additional mailing offi ces. Canada Post Publi- cations Mail Agreement No. 41450540. Canada return address: PO Box 2600, Mississauga ON L4T 0A8, Email: circulation@mining-media.com. Current and back issues and additional resources, including subscription request forms and an editorial calendar, are available at www.e-mj.com. SUBSCRIPTION RATES: Free and controlled circulation to qualifi ed subscrib- ers. Visit www.e-mj.com to subscribe. Non-qualifi ed persons may subscribe at the following rates: USA & Canada, 1 year, $90. Outside the USA & Can- ada, 1 year, $150. For subscriber services or to order single copies, contact E&MJ, c/o Stamats Data Management, 615 Fifth Street SE, Cedar Rapids IA 52401, 1-800-553-8878 ext. 5028 or email subscriptions@e-mj.com. ARCHIVES AND MICROFORM: This magazine is available for research and retrieval of selected archived articles from leading electronic databases and online search services, including Factiva, LexisNexis, and Proquest. For mi- croform availability, contact ProQuest at 800-521-0600 or +1.734.761.4700, or search the Serials in Microform listings at www.proquest.com. POSTMASTER: Send address changes to E&MJ, 11655 Central Parkway, Suite 306, Jacksonville, FL 32224-2659. REPRINTS: Mining Media International, Inc., 11655 Central Parkway, Suite 306, Jacksonville, FL 32224 USA; email: subscriptions@e-mj.com; phone: +1.904.721.2925, fax: +1.904.721.2930; www.mining-media.com. PHOTOCOPIES: Authorization to photocopy articles for internal corporate, personal, or instructional use may be obtained from the Copyright Clear- ance Center (CCC) at +1.978.750.8400. Obtain further information at copyright.com. EXECUTIVE OFFICE: Mining Media International, Inc., 11655 Central Park- way, Suite 306, Jacksonville, FL 32224 USA phone: +1.904.721.2925, fax: +1.904.721.2930, www.mining-media.com. 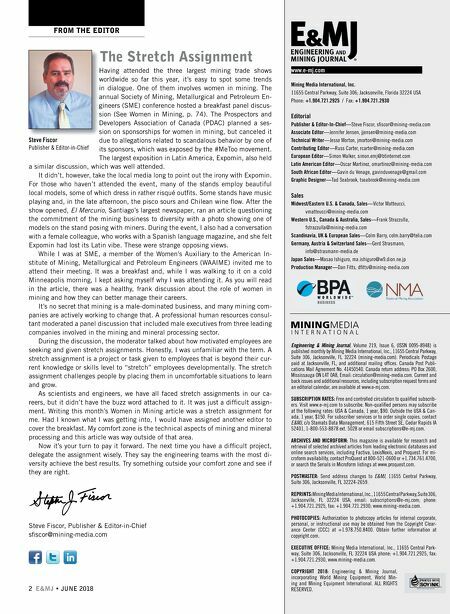 COPYRIGHT 2018: Engineering & Mining Journal, incorporating World Mining Equipment, World Min- ing and Mining Equipment International. ALL RIGHTS RESERVED.